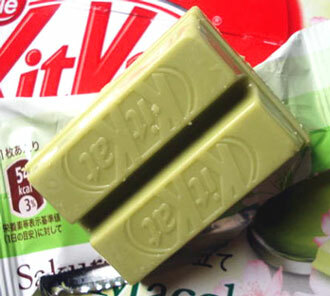 I don't think I need to constantly emphasize how much I love Matcha flavored confectionery, so needless to say I was excited about these new renewed Matcha flavor chocolates manufactured by Tirol Chocolate (abbreviated as 'Tirol'). 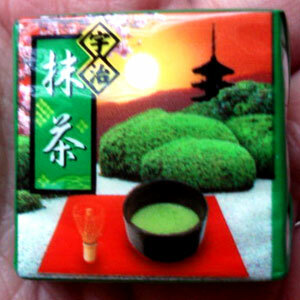 these pieces of dark green matcha chocolate were quite decent sized and the amount of matcha flavor in the chocolate was quite strong suggesting that a rather substantial amount of matcha content was infused into the choc. 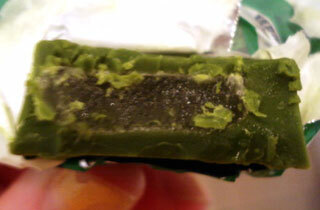 Each chocolate also contained a piece of matcha jelly embedded inside, the jelly was firm and chewy in texture and really helped to further enhance the overall flavor of matcha. The chocolate itself was rich and smooth in texture & consistency too. Overall this is without a doubt one of my favorite Tirol chocolates, really rich & balanced flavors, beautiful textures and consistencies and just overall very well executed I just can't get enough of it! 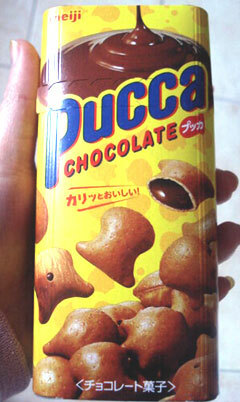 I've heard about these 'Pucca' chocolate-filled cookies from Meiji for quite some time so when I saw the original milk chocolate flavor stacked up among the snack aisle in Tokyomart, I grabbed a pack and threw it into my shopping trolley thinking it was about time I gave these seemingly cute treats a try. the fundamentals of these cookies are frankly very basic, milk chocolate filling encased in thin cookies shaped like different cartoon fish. The fish-shaped cookie shells were surprisingly rather thin but were slightly crispier and crunchier than regular cookie shells. 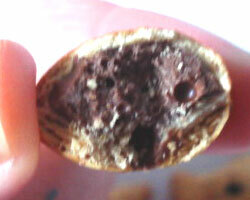 And each cookie shell contained a generous amount of sweet milk chocolate filling encased inside. Overall these cookies were quite appetizing to snack on, but there's really nothing special about them as far as I can tell, does it make me want to constantly go back for more? Not really. But it's still a good treat that I would gladly munch on once in a while. Although, I still prefer Meiji's 'Hello Panda' choc cookies which basically has the same concept except the 'Hello Panda' cookies obviously has a panda motif and its cookie shells are slightly thicker but softer in texture than Pucca's cookie shells. these Caramel Corn corn puff curls are really delectable, they have a softer texture compared to other corn puff snacks I've taste tested in the past, but they still have a lovely soft crunch to them, and are loaded with caramel flavor. And the nutty flavor of the roasted peanuts really complemented the sweetness of the caramel corn puff curls. 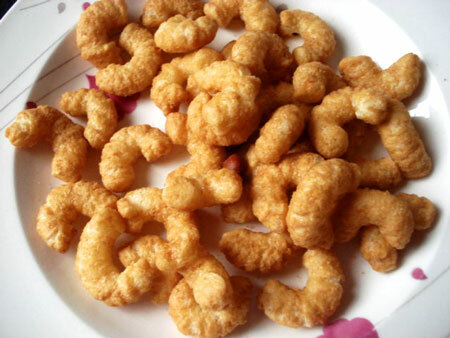 However, depending on the individual, some might find the sweetness of the caramel in these corn puff curls to be a bit too substantial and overwhelming for them. As for me personally though, the sweetness is just at the right amount. Overall these corn puff snacks are really yummy and flavorsome, there's really no real complaints I have about them. 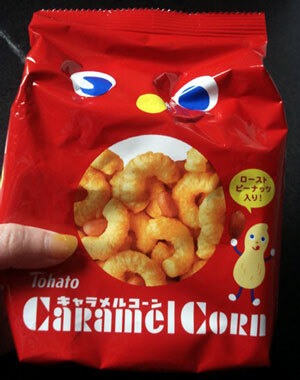 My fondness for Caramel Corn is such that practically every time I go out and buy Japanese junk food from Asian groceries or order them online, you can be sure to find at least 2 packs of these Caramel Corn snacks in my shopping trolley! Staying on the western side of the world's overwhelming confectionery market, here's another famous confection manufactured by Mars Inc., for me to review about the 'Bounty' chocolate coconut bar several days ago, anyone who is familiar with the western world of sweets would expect me to review another product from Mars Inc. which is probably so much more renown & popular than the 'Bounty', yes, I am referring to 'Maltesers'! Maltesers are one of my favorite non-Japanese confectionery brands, and that's perhaps understandable to anyone who has ever tasted these yummy balls of chocolaty malt goodness soft honeycomb malt fillings covered with rich smooth milk chocolate. The smooth sweet milk choc was melty in my mouth and the honeycomb malts helps to add texture to the chocolate as you savour each ball. The makers at Mars Inc. claims that the malt centers of these Maltesers contains less saturated fats than regular chocolate centers, defining these Maltesers as a more healthier option compared to most other chocolate confections, which is all the more reason to love these little malt choc balls! 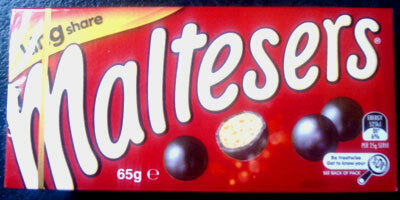 Overall, for me personally these Maltesers are just irresistible! It's one of the few non-Japanese confections that has me coming back for more time and time again, there is really nothing I can fault about Maltesers as a product itself. Although, I do wish the makers at Mars Inc. would be more creative with the variants of Maltesers. Apart from the regular milk chocolate and white choc flavors, I don't recall Mars Inc. ever releasing any other kinds of flavors. Come on, just 2 flavors is hardly enough, how about strawberry chocolate Maltesers? Or Caramel choc? Aside from the very limited variant, there's nothing I can complain about the product itself. It's not often I review about sweets & snacks that are not from Japan, and this is one of those rare occasions when I take a break from exploring the vast Japanese junk food wonderland and turn my attention to sweets from other parts of the world. I was grocery shopping yesterday and came across these 'Bounty' coconut chocolate bars on sale at the supermarket for only $1 each. I have to admit I'm not a big fan of coconut and neither do I pay any attention to confectionery made with coconut most of the time (but that's not to say I don't like coconut either), but this was such a sweet deal I felt too good to pass, it's not everyday you come across whole chocolate bars on sale for just $1. originating in the UK and sold almost everywhere in the world, these Bounty bars have a long history. 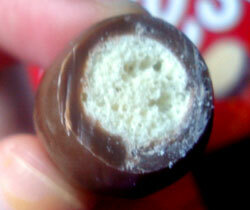 Milk chocolate coating was rich and melty in your mouth and with a very substantial amount of sweetened coconut filling. This was actually not my first experience with these Bounty coconut bars from Mars Inc, I remember very vaguely the first and only other time I tried these Bounty bars was when I was still in junior grade school, which felt like a lifetime ago (and I'm glad I put those years behind me)! I had forgotten just how sweet the coconut fillings were in these Bounty bars, and indeed the overload of sweetness from the coconut feeling was quite confronting for me. But nonetheless the experience did somewhat bring back some nostalgic feelings for me about that first ever experience I had with the Bounty bar many years ago. I felt the sweetening of the coconut was unnecessary because there was already a substantial amount of sweetness from the milk choc coating. With the amount of overall sweetness further enhanced with the sweetened coconut feeling, it was basically just an overload of sweetness that was way too much for my liking. 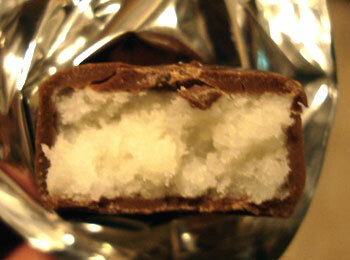 However on the upside, I liked the rich milk choc coating, the soft texture of the coconut filling and the fact that these Bounty bars came in 2 individual halves so you can share it with others, indeed, I gave the other half of my Bounty bar to my mum...she seemed to have enjoyed savoring it better than I did. Overall not a bad chocolate bar, just a bit too sweet for my liking, and that's just my personal preference. If the makers at Mars Inc had laid off the sweetening of the coconut filling, then I probably would've liked these Bounty bars a bit more. But if you like coconut and don't mind an overload of sweetness, then you'd probably like these Bounty coconut choc bars more than I do. I have to admit, I wasn't particularly interested in these 'Takenoko no Sato' cookies from Meiji in the past, the only reason I ordered this from NapaJapan was because they had it on sale at the time selling for only US$1 a box, so I thought "why not? ", it's about time I gave these cookies a try anyway. And I'm glad I did because these were surprisingly good. 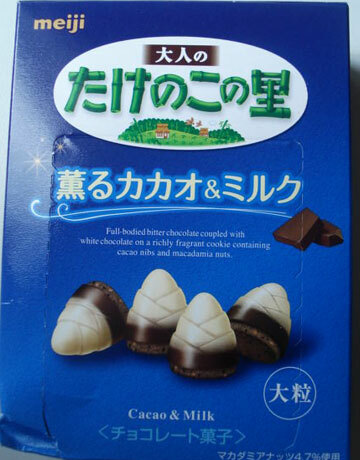 the reason behind the naming of the brand for this particular cookie snack is quite literal, the hiragana 'たけのこ' (Takenoko) in its brand name literally means 'bamboo shoots' in Japanese, hence these cookies are shaped like little bamboo shoots. Let's start of with the cookie base first, it wasn't hard like I had expected, instead the texture of the cookie bases were soft and crumbly with tiny pieces of slight bitter cacao chocolate and macadamia nuts embedded throughout. The coupling of the slight bitterness of the cacao bits and the nutty taste of the macadamia nut pieces really enriched the cookies with beautiful complementing flavors. 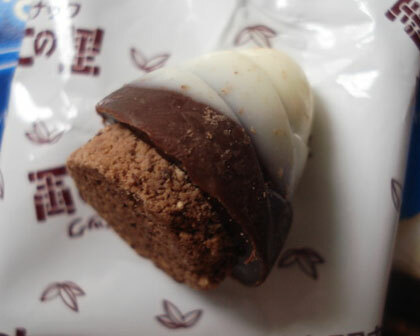 The slight bitterness of cacao was further enhanced with the layer of rich dark cacao chocolate on top of each cookie base, which also blended really well with the sweet white choc. However there is one thing I'm still scratching my head about is Meiji's marketing of this particular release as a "cacao & milk" flavor release. I certainly understand the significant presence of the cacao contents used in the execution of this particular release of Takenoko no Sato cookies, but I'm still trying to wrap my head around the "milk" aspect of it, because I just cannot comprehend the significance of that. 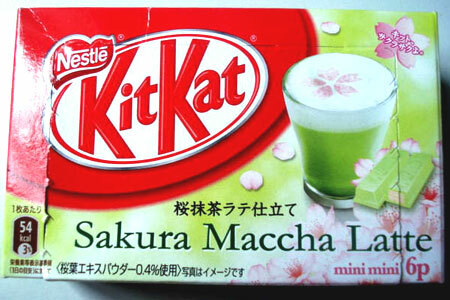 If milk was suppose to be a main aspect like cacao for this marketed flavor, then it was very vaguely delivered. Unless the makers at Meiji were referring to the milk solids used in the production of the white chocolate topping, still, I think the macadamia nuts embedded in the cookie cases posed a much bigger significance. Anyway, overall these cookies were really tasty and delectable, I really came into this taste testing without expecting much and I was pleasantly surprised that's for sure. I'm starting to regret not trying out these Takenoko no Sato snacks sooner, perhaps I would've tasted enough different released flavors of it by now to add it to my ever-growing list of favorite snack brands. But since this was only my first taste experience with these Takenoko no Sato snacks, it's too early for me to add the brand to the list...perhaps after some more tasting with different flavors will change my mind.